Profile: Goldsmiths Graduate Alex Garnett, formed design studio MIXKO with a fellow Japanese student Nahoko Koyama, from 2003-2010. In 2010 Alex established himself independently under WWW.ALEXGARNETT.COM. 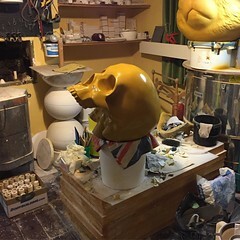 A self taught ceramicist, and experienced prop maker - Alex produces all his own work, applying his interests in visual art. Alex’s objective is create items which posses a satisfying simplicity and inspire. Alex has produced a wide range of works, encompassing everything from interior design objects and modern sculpture to fashion accessories and graphic design. Past clients include Bloomberg, Dirk Bikkembergs, Paul Smith and Top Shop. New Cards In Store Now! Greetings Cards In Store Now! Stockholm furniture fair with Designboom!